Solid 115K xp/hour with tele-alching to addy. Very versatile, flexible script. Thank you! The only constructive criticism I can give is that, for superglass make with normal seaweed, it sometimes struggles with withdrawing items from the bank. I found that if you accidentally have a 14th seaweed in your inventory, the bot seems to think that it already withdrew seaweed, and kinda opens and closes the bank in a loop. Also, it sometimes hovers over random items in the bank looking for the sand/seaweed. I'll take a look at that seaweed issue. Thanks for letting me know. Great bot! I have done tele-alch and stun-alch for a considerable amount of time with amazing xp/hour. Bot works well and the interface is easy to use and gives you the information you want. However, the bot starts to charge you way to fast, and does not give you enough time to figure out your setup. 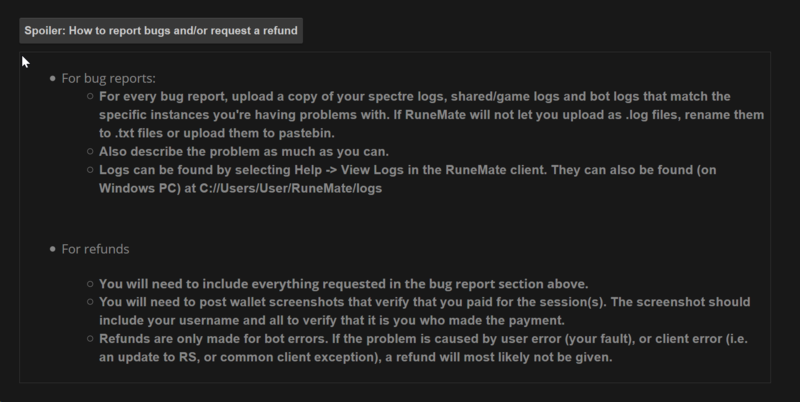 The creator deserves credit for his good overview, but getting charged as soon as you open the bot interface is annoying and greedy. Concept is good and used to work flawlessly, but stunalching is super slow atm. takes 3 seconds inbetween casts. Bug report is in the overview. Not sure why this warranted a review instead of a bug report if you're saying it works well normally and this is abnormal behavior. 125k exp/hr stun alching. I'd give this 10,000,000 stars if you could make it not waste a tick or 2 doing nothing, pm me for more info. If you are having problems with xp/hr, you will need to post a bug report. Guide is in the overview. Mostly been using it for teleporting and it's very clean, great inputs. Just had a minor request though, would it be possible to add an actual tele-alching function? I realise you can do teleports with alching but this gives roughly the same XP as regular teleporting. It also alches first then teleports rather than alching right after teleporting. Tele-alch combo casting should be supported. Specifically for tele/alching, you have to alch first instead of teleporting first because you can't stop the tele animation with an alch. Those spells aren't included because the gp/xp is extremely bad. For example, Curse and Bind are unlocked within 1 level of eachother. Curse gives only ~1-1.5k xp/hr less than bind, yet costs less than 1/10th of the price bind does (30gp vs 470gp per cast). It's the same for all the other options. You'd be gaining almost no extra xp by using bind/snare/entangle, yet paying waaay more than necessary.